What did you feel like before the program with your health? I was stressed constantly at work, family and life. Lacking in energy and always tired. Lacked motivation for consistent exercise and continuously getting injured. My weight and size increased so my clothes weren’t comfortable and had to buy looser clothing. I had tried other programmes and the gym but nothing seemed to work / fit my lifestyle to make it easy to continue. My own health was a very low priority and I put everything else first. A work colleague told me about Busy Mum’s which sounded great so I trialled the 14 day challenge and really loved it. 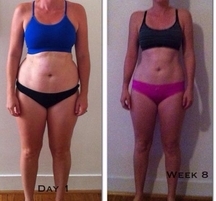 I started the 8 week programme then switched to the UBM in early December. I love the accountability, motivational support and versatility of having the workouts on my phone, I think that’s why it works. I’m quite a structured person so like to have a schedule to follow which is flexible enough for me to fit/work into and around my busy life, no matter where I am. No more wasting an hour getting to and from the gym for the same old workout. My workout is done at home (or where ever I may be – hotel hallways ), only needs a small area and is over in 26 -45 mins depending on how I’m feeling. Just when I think I’ve got it under control and I start to drift a little a motivation video or discussion will quickly get me straight back on track and motivated again (it feels like someone’s been watching me as they as say exactly what I’m needing to hear). I can’t believe how calm I am now, my stress has just disappeared and I deal with things with clarity and calmness (the majority of the time). I also look forward to doing my workouts and how good I feel afterwards. Any advice for other Mothers? I have my virtual diary loaded into OneNote accessible via my computer and my phone. I created a template calender which I update at the beginning of each month (10mins) which has my ‘proposed’ meal and exercise plan, plus my goals. I also have noted my daily routine to follow (and a reminder in our family calendar and my work calendar to remember my daily routine). I set my alarm and do my workouts each morning so it’s done for the day (I’m not a morning person but it’s getting easier). This really works for me as I don’t have to think about ‘what I’m going to eat’ or ‘what exercise I’m going to do when’ or ‘what workout I’m up to’. Its all there in my plan. Of course I’m flexible when things change, but it makes it easy to plan and prioritise my day and week around my health. I’ve told my friends and family about what I’m doing and they support me, even when I’m away on social weekends and holidays I get them all included in the workouts and there’s no hassles about choosing healthy choices (that was my confidence issue not theirs). Stress is now a thing of the past, I’m much more confident about my own priorities, I’m loving my happy mindset and a much better loving relationship with my family – wow I’d been MIA for a while.